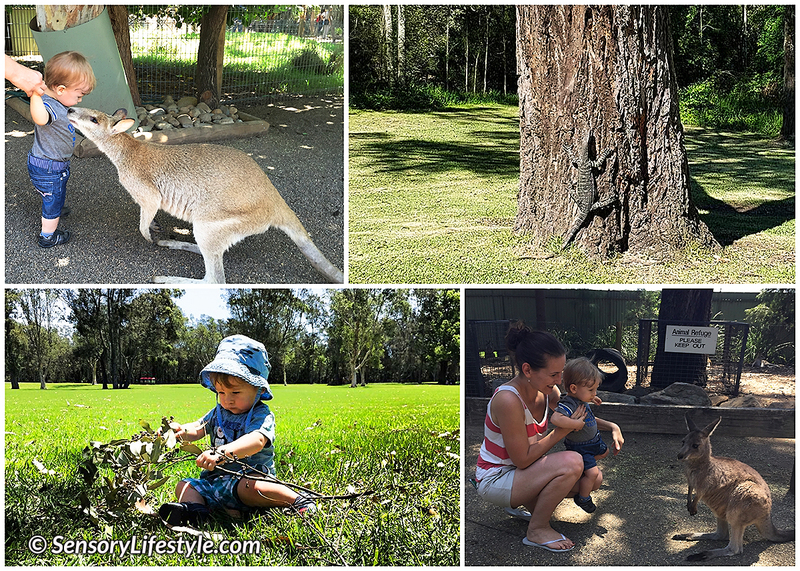 I was so excited to fly to Australia that I didn’t even think about the adventures that were awaiting me. One beautiful morning we all ventured out to a park. My uncles got busy starting a barbie for lunch. I decided this was the perfect time to explore. I wanted to see the nearby playground and the surrounding fields. I got my cousin and my dad and off we went to explore. As soon as we started to explore we noticed lots of different bugs on the ground. I was so excited to see them in action. Then, as I lifted up my head I saw the most amazing creature. It was bigger then me and was crawling on four legs. It had a long tail and a slithering, long tongue that kept coming out of its mouth. I was so exited, as I have never seen this creature before. ‘Look, a goanna!’ said dad. I started to move closer for a better inspection but my dad quickly swooped me up. Unfortunately my inspection concluded from afar. It slithered and moved slowly through the green grass and the tall trees. I wonder where it’s going? I can’t wait to see what other unusual creatures I will see on my Australian adventure. The first birthday is almost here! Wow! I’m sure you have noticed how much things have changed in the last 11 months. Here are some highlights of what you may notice your 11 month old do. You are probably seeing more and more movement from your little one. At this age, your baby should be cruising around while holding onto the furniture or your hands. You may start seeing them let go and stand for a few seconds. Some of you may even start seeing a few steps from your little one. They may even be walking independently. Some may be a little more adventurous. They might find things to climb onto as they explore their surroundings. As long as they are safe you don’t need to make it too easy for them. Fine motor skills continue to improve. Their little hands have been working hard. They have been practicing grasping, releasing and manipulating objects around them. You may notice them starting to pull things apart and put them back together. Their hand eye coordination skills are improving. They should be able to use their pincer grasp to grab small items. You may start noticing temper tantrums as they try to express their needs. For example getting upset when their toy has been taken away. They may also engage in a back-and-forth conversation. When you ask a question, you’ll get a response, although you probably won’t understand most of that response. They will also be able to point to familiar things such as a family pet, car or a ball as you name them. Here are some activity ideas that you can try with your 11 month old. These activities will expose your baby to many stimulating environments and movement opportunities. They will also develop their sensory systems while fostering creativity. As always they have been tried and tested. Looking for another texture to play with? Luckily the supermarket shelves are full of fun ingredients that are safe for little ones to play with. This month I thought we could try potato flakes. Here are some ideas on how we can play with them. Start off playing with them as a dry mixture. You can add cups, spoons or other sand toys to fill, pour and mix the flakes. Next you can add some water into it. The little ones can mix it with spoons or hands. Once combined, the flakes mixture can be used to mold things. Build balls, towers, squish them into their cups or other containers. They can poke them or move them between containers. You can hide small cars or blocks in it. Then they can dig through with their hands and find the hidden treasures. For extra visual fun you can add some food coloring to change the colors around. Best played in the warm months of the year. To start, make colored ice cubes by adding a few drops of food coloring to water. Then pour the water into an ice cube tray and freeze. Best locations to play with the ice are either outside or in the bathtub. If playing outside place the ice on the floor or in a container filled with clear water. 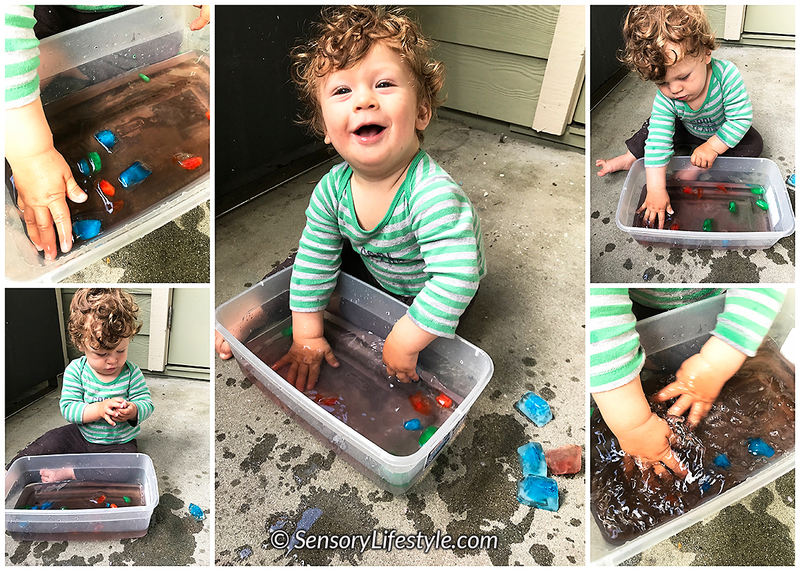 Your little one can explore the cold temperature by either handling the ice with their hands or splashing it around the container. If using the container they will be getting a nice surprise as they watch the water change color as the ice melts. Are you ready to play with a ball? Here is a fun way to start building your little one’s ball skills. Have them sit on the floor with their legs straight out in front of them. Spread them apart so they can catch a ball that is rolled towards them. First sit next to them and help them roll the ball forward. Then sit in front of them and roll the ball back. Keep going back and forth and help them out as much as is needed. Once they start getting the concept of turn taking and rolling the ball you can advance to the next step. Try rolling the ball so it ends up on their side. To get the ball they will need to rotate their trunk, which strengthens many muscles. Then switch things around and roll the ball to the opposite side. While rolling you can also sing, and use a variety of textured or differently sized balls. Crawling continues to be a very important activity for your little one. Anything that encourages them to get on their fours and crawl will make them stronger. This month’s crawling activity will encourage some problem solving. To start, set up a tunnel. This tunnel can either be store bought such as those found on amazon. Or you can create one using furniture and bed sheets. Once the tunnel is ready, place either a balloon or a ball inside of it. 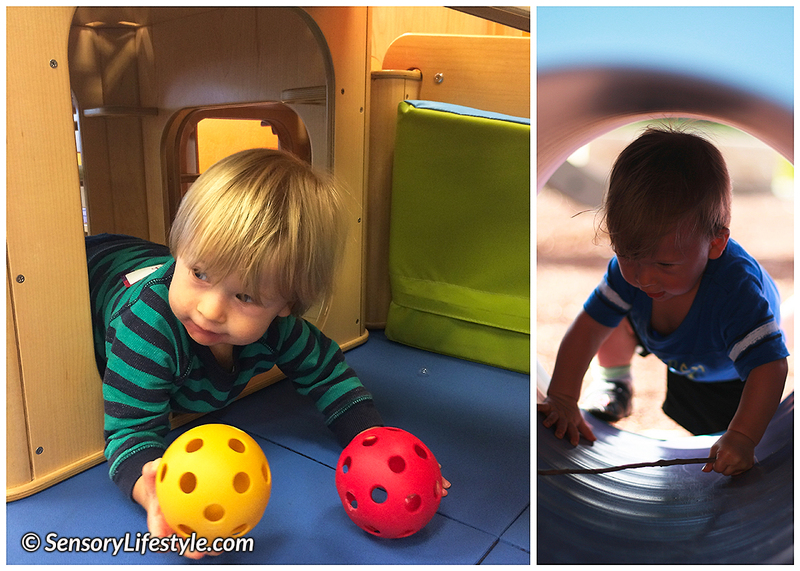 Encourage your little one to crawl through the tunnel and push the ball out through to the other side. Initially, they might stop and play with the ball inside the tunnel. That’s fine. Let them explore and enjoy the play. Don’t rush them. Offer help if needed. Once they get the idea you can place other toys inside and have them retrieve it. So here it is. To get walking you need to first know how to stand. Before you know how to stand you need to strengthen lots of muscles. To do that you need to have the opportunity for lots of floor play and crawling. In the last few months including this one I have been giving you lots of crawling ideas. This game is about standing. To help your baby learn to stand you need to provide lots of opportunities to do so. One way, is by giving them the opportunity to stand while holding on to a piece of furniture. Preferably, one with no sharp edges, such as a sofa. While sitting close to them present your baby with one of their favorite toys. The key is to hold it close to the hand that they are using to support themselves with. Hopefully they will let go and grab the toy. They may reach and then hold on to the sofa again. That is fine. They will continue to hold on to the sofa until their balance skills develop. Keep encouraging them to let go. As they grow stronger they will be able to stand independently for longer periods of time. Your babies are becoming little scientists. They are continually exploring and experimenting. By having the opportunity to fill and dump contents from a container they learn many valuable skills. They start to learn concepts like gravity, object permanence, volume and measurement. Your baby will continue dumping, filling and observing all the way to toddlerhood. For this game you can use any grains that you want or have available. I used quinoa as this was the expired ingredient in my kitchen. If playing outside you may consider using birdseeds. Once it gets messy you will have tiny little visitors who will clean it all up for you. 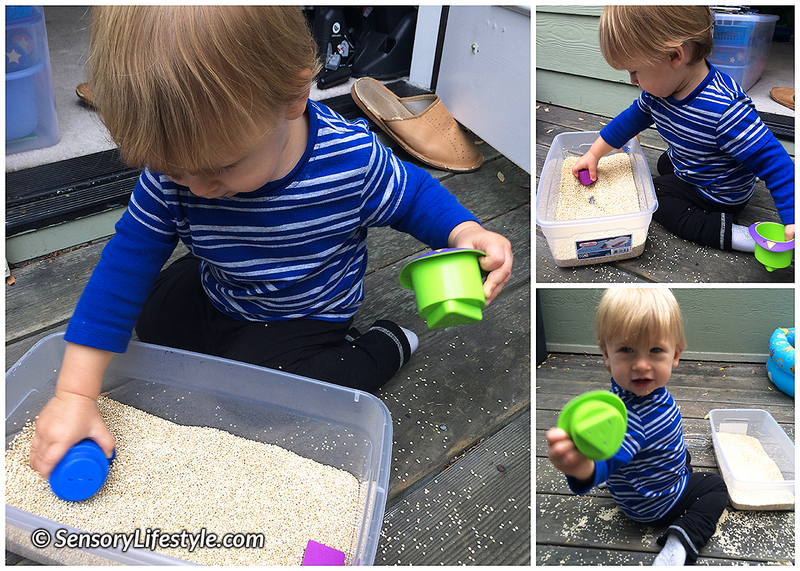 This activity encourages and provides an opportunity to practice the ‘Fill & Dump’ skill. Dumping is much easier, so this is the task to start with. You can fill the containers with the grains and let them dump it out. You can use various sized containers for this experimentation. Once this is mastered it’s time to practice filling the containers. Note that this step requires much more precision. It can take months to master. It’s time to have some fun with the bubbles. This is a great way to stimulate your baby’s visual skills as well as encourage movement. Simply blow the bubbles towards your baby. Your baby’s eyes will follow them as they float in all directions. Then, encourage your baby to catch the bubbles. If sitting they may end up crawling to go after the bubbles. See if you can also get them standing while holding on to the furniture and catch the bubbles. Hopefully they will let go of the couch and catch some bubbles. Who knows, maybe you can even get a few steps from your baby as they try to catch them. Puppets are so much fun. Even at this age your baby can have lots of fun watching a puppet show. It is also a great activity to help develop your baby’s visual and language skills. As you move the puppets, your baby’s eyes will follow them. Let your puppets move in various directions (high, low and to both sides). Just make sure not to move them too fast. Some of the puppets can move in to your baby for a kiss and a cuddle. You can also use a funny voice to grab their attention and make them laugh! Place your baby on your lap. Then have fun singing and moving your baby to the lyrics of some of the popular nursery rhymes. Always make sure that you don’t do any fast and jerky movements. Frequently check in with your baby so they don’t get over stimulated. 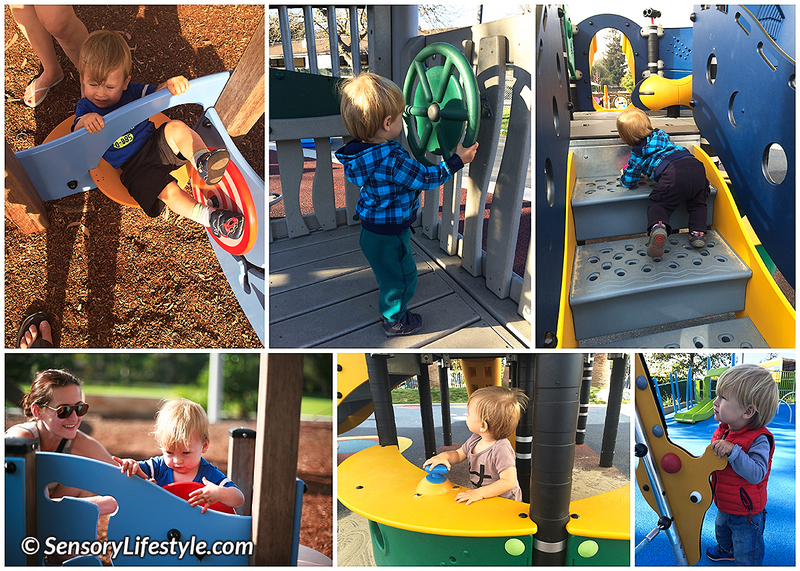 Even if your baby is unable to walk or climb they can still have lots of fun on the playground. There is so much to explore. It targets all the senses and of course builds a variety of essential skills. So there you have it. 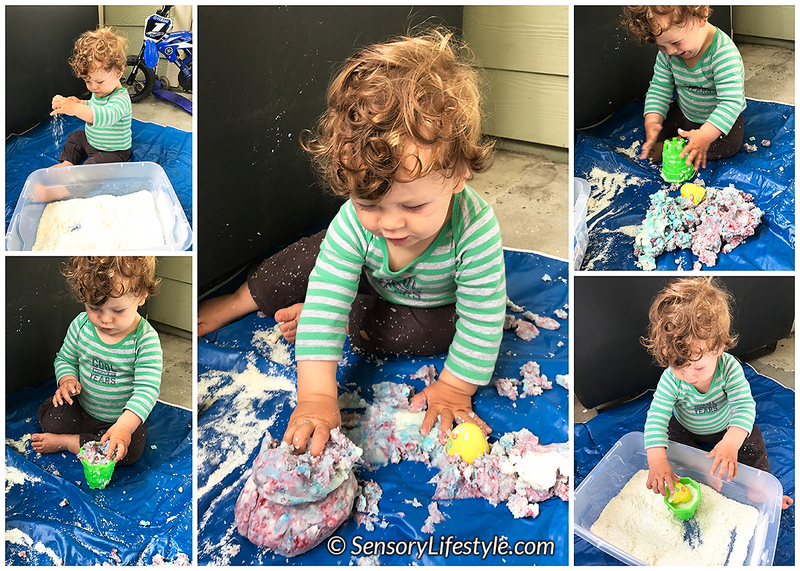 My top 10 Sensory Activities for your 11 month old that you can do today to help their development.